Erin O’Neil ’17 will spend the first six months after graduation in Asia, thanks to her experiences at Butler. On May 6, Butler’s Class of 2017 will walk across Hinkle Fieldhouse, accept their diplomas, and step into the next chapter of their lives. Her job is with the company Collective Responsibility, where she was a digital media intern this summer. The company helps businesses become more sustainable, and provides companies with research about the development of civil society, business sustainability, and social development in Asia. O’Neil originally went on the summer program because she thought it would look good for the Fulbright-National Geographic Storytelling Fellowship. She had planned to apply for the fellowship this semester so she could focus on sustainability and urbanization. After hearing a panel of fellows talk, she realized it wasn’t her path. That something else ended up coming from the founder of Collective Responsibility. Throughout the summer she worked with Brubaker, and he trusted her to help him with his vlog series on entrepreneurship in Asia. He wants to interview entrepreneurs and sustainability ambassadors all over Asia for a video series that hopes to inspire sustainable practices worldwide. She will be traveling Asia for 3-6 months. Now, O’Neil can’t imagine not going to Shanghai this summer. 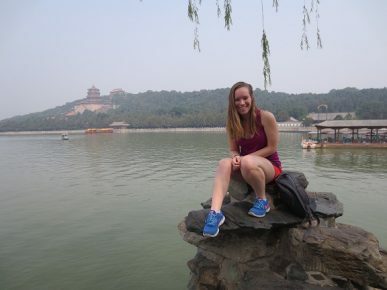 She says between the GALA program (Global Adventures in the Liberal Arts) and Butler in Asia, she has gotten opportunities she would never have dreamed of. The Butler in Asia program is the product of a generous grant from the Freeman Foundation, whose aim is to provide U.S. college students “real work experiences in real work settings with direct interaction with local people in east and southeast Asia.” This is an excellent experience offering students the long-term benefits of study abroad and resume-building opportunity of an internship. Butler is one of only 23 universities in the United States that the Freeman Foundation is working with to create internship programs in East and Southeast Asia. During the summer of 2015, the foundation awarded $99,500 for the initial summer internship program, which resulted in 19 students going to Shanghai. It followed up with a $339,000, two-year grant to expand the program both in students and in locations. The result: 19 students, including O’Neil, spent the summer of 2016 in Shanghai. This summer, 45 students are slated to go—25 to Shanghai and 10 each in Beijing and Singapore. The planning and implementing of the grant is done by Butler’s Center for Global Education, which works with nearly one-third of Butler students to have an overseas experience during their four years.